​Anti-police social media postings have spawned a wave of arrests across the United States in recent days, after the double murder of two New York Police Department officers on Saturday was revealed to be predated by an ominous internet threat. Individuals in New York, New Jersey, and Colorado were apprehended by law enforcement on Monday this week for making web postings purported to advocate killing cops, local networks reported. That same day, police in Massachusetts announced they are pursuing criminal charges against a man who wrote the term “put wings on pigs” on his personal Facebook page – a reference to a social media post that prefaced Saturday’s double homicide. Devon Coley, 18, was arrested by police in Brooklyn on Monday and arraigned on a charge of making a terroristic threat after posting on Facebook a cartoon of a gunman opening fire at a patrol car alongside the phrase "73Nextt,” believed to be in reference to a nearby police precinct. In Colorado Springs, CO, 33-year-old military vet Jeremiah M. Perez was caught by police and later arraigned for posting online, among other threats, “VETERANS WILL KILL RETIRED HELPLESS COPS." Meanwhile, in Massachusetts, the Chicopee Police Department said this week that it will ask a district court to charge 27-year-old Charles DiRosa with threatening to commit a crime after he allegedly posted the phrase "put wings on pigs" on his Facebook page in the wake of Saturday’s shooting. "In the eyes of every police officer in America today, 'Putting wings on pigs' is a threat,"Chicopee Police Department spokesman Michael Wilk said on Monday. If the court agrees, DiRosa could be charged and taken to trial. Screenshots purported to be of the post have subsequently surfaced online, however, and suggest that DiRosa surrounded the comment with quotation marks – and, perhaps, was just quoting the controversial Instagram caption. Locking up web surfers over concerning social media posts isn’t too common of a practice – but it's not anything new, either: a Texas teenager made headlines in 2013 after writing on Facebook that he wanted to eat the “still, beating hearts” of school children, and a South Carolina boy was arrested back in August when he posted about using a gun to kill his neighbor’s nonexistent pet dinosaur. Earlier this month, a Washington state man was apprehended on felony charges after he allegedly plotted openly on Facebook to murder Darren Wilson, the former Ferguson, Missouri police officer who killed Michael Brown, an unarmed black teen in August. Four months after Brown’s death sparked a coast-to-coast movement in which activists have taken to the streets to speak out against police aggression and racial profiling, a string of other incidents in which white cops have avoided charges after killing black suspects have widened the rift between law enforcement and the people they’ve sworn to protect. However, now following what has been mostly peaceful protests across the country – and even a massive march against police brutality that attracted thousands to Washington, DC earlier this month – Saturday’s double murder in Brooklyn has prompted police departments everywhere to warn officers of being on high alert. 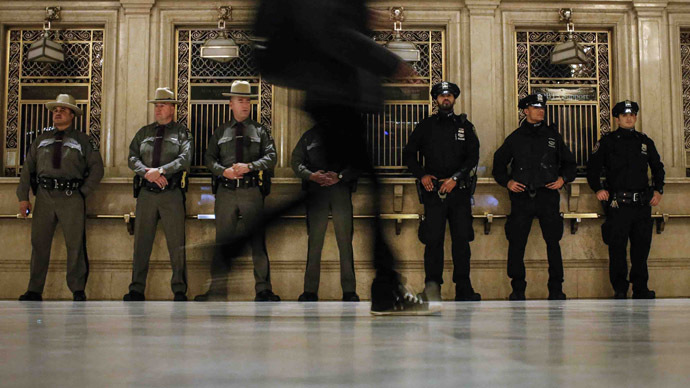 The Associated Press reported on Wednesday that security has been increased at New York City precincts, and law enforcement in the Big Apple has apparently received more than 40 threats since Saturday’s shooting. The results of a Gallup poll published earlier this month indicated that African-Americans' trust in their local police is far lower than that of whites and Hispanics. It also found that law enforcement has without a doubt been going above and beyond to try and ensure relationships don’t worsen further, and that another “put wings on pigs” post doesn’t slip through the cracks and end once more in tragedy. According to some, though, social media posts – at least the DiRosa instance in which the Massachusetts man emulated Brinsley’s new infamous Instagram comment – shouldn’t be grounds for grabbing Facebook users from their computers and hauling them off to prisons. “DiRosa’s Facebook comment is likely protected by the First Amendment, unless there are more facts that aren’t being reported. It isn’t punishable incitement of crime – to fit within the incitement exception, speech must be intended to and likely to produce imminent unlawful conduct, as opposed to just being ‘advocacy of illegal action at some indefinite future time,’” legal expert and Washington Post blogger Eugene Volokh wrote on Tuesday, adding that the alleged threat in question was also absent of any indication that the poster plotted to kill a cop at a definitive time. “The police have ample authority to investigate people who say such things, and see whether such speakers are actually planning something beyond speech. But prosecuting a person based on such a statement is, I think, forbidden by the First Amendment,” he wrote for the Post’s Volokh Conspiracy column. Wilk, the spokesperson for the Chicopee police, told The Republican newspaper that officers weren’t monitoring DiRosa, but were alerted, rather, by an anonymous Facebook user. "Someone sent us a message to let us know and that they were concerned because they don't want to see us hurt,” he said. Afterward, according to the paper, an advisory was forwarded to the Massachusetts State Police and to the Commonwealth Fusion Center warning officers “to use extreme caution” around DiRosa, should he be spotted, despite the district court having yet to formally charge the man with any crimes. Others being investigated for internet postings do face significant charges, however, and likely won’t be able to benefit from the same legal defenses offered by Volokh in regards to the potential DiRosa case. In Brooklyn, authorities took into custody Coley, an apparent member of an area street crew, according to the Daily News, after being alerted not just of the offensive Facebook cartoon, but of possible gang plans involving the storming of area precincts. And in Tinton Falls, Reardon faces counts of third-degree aggravated assault, third-degree making terrorist threats, and a disorderly persons offense, according to NJ.com, for his “pigs” remark and an alleged altercation that occurred while he was being arrested. In Colorado, meanwhile, court documents show that the Federal Bureau of Investigation began surveillance on Perez last week after being alerted to posts made on YouTube and Google Plus about wanting to “hunt” cops. Perez admitted to making the comments during an interrogation with the FBI on Monday and is currently in custody pending a detention hearing and preliminary hearing scheduled for next week, Denver’s 7News reported. He faces a $250,000 fine and five years in federal prison. "If you threaten to kill – or incite others to kill – police officers, you will get some very serious attention from this office, the FBI, and other appropriate authorities," US Attorney John Walsh said in a statement. Drugs and alcohol, on the other hand, might serve as a deterrent for potential prosecution: police in Memphis, Tennessee questioned a man on Sunday who wrote on Instagram: “Good job. Kill em all I’m on the way to NY now #shootthepolice 2 more going down tomorrow.” Daryl Lofton was subsequently interviewed by the US Department of Homeland Security, WREG reported, but federal agents declined to press charges for now, after learning that the remark was posted while its author was drunk and high on marijuana.